Springtime is a great time of year in Michigan. The flowers start to come out of the ground, the trees start to bud and the birds start chirping and building their nests. Sometimes if you are lucky enough birds will choose your dryer duct as a nice warm location to build their yearly nest. Dryer venting is made to exhaust the air from your dryer outside. When this passage is blocked by lint, twigs or birds you may have a problem on your hands. Your dryer can take much longer to dry your clothes or even worse, catch on fire. In the springtime it is important to keep a close eye on your dryer and the ducting to make sure you are bird free. Some early signs that should not be ignored are noises in your venting, seeing birds around the exterior vent or increased drying times. 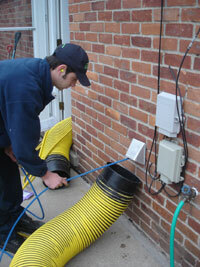 Amistee is a trained professional for cleaning dryer ducts in Michigan. We are very familiar with dryer ducts and the problems that occur from having this venting clogged. Call Amistee today to have a trained dryer vent technician clean and inspect your venting to make sure you are having the top efficiency and preventing a fire. Call Amistee in Michigan at 248-349-8877 today!